For those with more Christian tastes, the so-called experts at Wikipedia have an article about B. Photo of what the collector's edition DVD case of B might be like. B, made by StrawberryClock Entiprises ( In afilliation with Global Star Movies ), is one of the top grossing movies of all time. August 15, the day it came to theaters, is now known as "B Day." Because of this, this date is also known as Clock Day, for some perverted reason. In the year 2006, B would have been released as a special edition DVD, containing all the crap B left out. B starts out on a white screen. It then ends. Some think that B was something of a peripheral catalyst and that it was some sorta summer hit, and StrawberryClock would have ended up bankrupt with or without it. Others think that B is the reason the language AAAAAAAAA! was created, and if StrawberryClock had never made B, AAAAAAAAA! as we know it would not exist. Regardless of this, B is a symbol of the letter after A and before C, as well as showing that the very birth of AAAAAAAAA! is rooted in the forbidden letter of the language. It serves as a reminder of where we come from. However, the usage of B in texts such as flash movies and forum posts are considered to be, by many Uncyclopedians, overused. Poor usage of B is generally considered to display signs of a n00b. B has been illegally pirated into many flash movies serving a variety of different purposes over the years since it's been released. PepsiClock, for example, made C, a flash that is known for the copywright infringment of B, but C kills B. 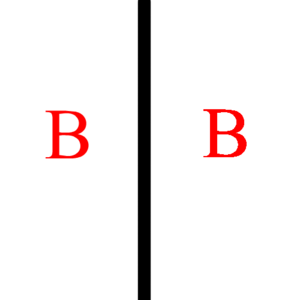 A comparison of a Legal version and an Illegal version of B. As well as several appearances, B has also been used as a one-letter term in movie titles. Examples include Never B Your Woman, Let it B and B reasonable. There are new B's, but nobody takes newBs seriously, anyway. In anonymus foreign lands, they have an alternate version of B called "A." Although an Eastern-Europe exclusive, it has been ( illegally ) published worldwide, thanks to Coolboyman's SheezyArt page. A can be viewed here. A Hong-Kong pirated version of "B", viewable online. This page was last edited on 18 February 2014, at 23:52.